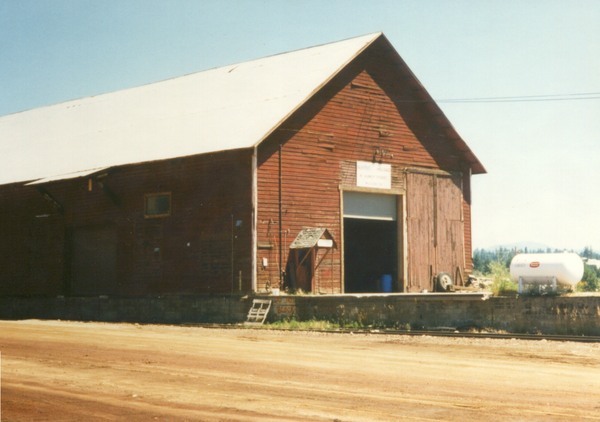 In the first decade of the 1900's the McCloud River Lumber Company constructed a series of shop buildings immediately south of the roundhouse. These buildings served the railroad well until the new diesel shop building replaced them in the mid-1950's. The railroad afterwards used the buildings mostly for storing rolling stock. Shortly after U.S. Plywood purchased the McCloud companies in 1963 they decided to add a large warehouse to the sawmill operations. The company chose one of the old shop buildings as the site for this new facility. Most of the existing shop building remained intact, with the large warehouse added onto the north end of the structure. The finished building had two rail sidings, one that ran in the open along the west side of the building and the other running into an enclosed area on the east side of the building. The facility also included a truck loading area. The building became just another part of the McCloud sawmill after that. The facility gave the lumber company one more place to store and load lumber. This use ended in 1979, when the McCloud mill closed down. The warehouse fell silent. The warehouse sat silent for a little over three years. In the fall of 1983 the facility once again saw lumber moving through it, but not the pine and fir it was used to. A little less than a hundred miles southwest of McCloud lay another small former company timber town named Korbel. Korbel lay in the redwood country, along the Mad River a few miles inland from the coastline. The Northern Redwood Lumber Company started the town, with the Simpson Timber Company taking over in 1956. Like McCloud the Korbel mill shipped its product over a common carrier shortline, in this case the Arcata & Mad River Railroad. The "Annie and Mary" as it was known ran seven and one half miles from Korbel down to a connection with the Northwestern Pacific Railroad at Korblex, on the northern edge of Arcata. This situation worked well until the winter of 1982/1983, when a series of powerfull storms washed the NWP out in many places. The NWP finally restored service to the Eureka area in early June; however, the company instituted a $1,200 per carload surcharge on all traffic moving to and from the Eureka area. The Arcata & Mad River Railroad closed up shop, as Simpson and the other shippers on the line found trucking lumber to other railheads in the area far more economical than paying the new surcharge. The McCloud River Railroad management watched the situation on the coast with more than a passing interest. 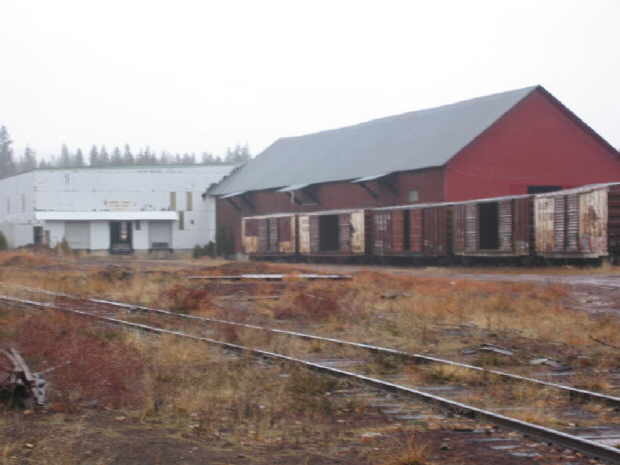 The railroad had the vacant warehouse building and connections with three mainline railroads, which could be attractive to Eureka area shippers that had formerly been held captive by one outside connection. The railroad marketed the warehouse to the shippers affected by the suspension of rail service, and before long they had an interested party in the form of Simpson. Simpson Timber Company soon had a fleet of trucks moving lumber from Korbel to McCloud, where it was reloaded onto railcars. The McCloud River Railroad suddenly found itself moving many carloads of redwood out to the two connections, mostly in Simpson's home fleet of all-door boxcars. The efforts to get this traffic prompted Modern Railroads to awared the McCloud River a shortline marketing award. The redwood traffic gave the McCloud River Railroad a big economic boost, but it did not last. On 1 September 1984 the Northwestern Pacific sold the part of their railroad running from Willits north to Eureka to a new shortline, the Eureka Southern. Simpson promptly closed their McCloud reload in favor of a new loading site on the Eureka Southern in the Arcata area. Once again the McCloud warehouse fell silent. The warehouse sat vacant for only a few years this time before another occupant moved in. Once again the McCloud River Railroad played a large part in finding the new shipper, and once again the new business created by the warehouse gave the railroad a much needed economic boost. Commercial printing giant R.R. Donnelley & Sons operated a huge printing plant- known as their Reno Manufacturing Division- at Stead, NV, which lies just north of Reno, NV. This plant consumed enormous quantities of paper, most of it manufactured in the upper Midwest and southeastern Canada and shipped to Nevada by rail. The delivery process involved several different railroads and often was slow and uncertain at best. Most of the paper traffic originate on or near the Burlington Northern, which did not come any closer to Reno than Nubieber, CA. 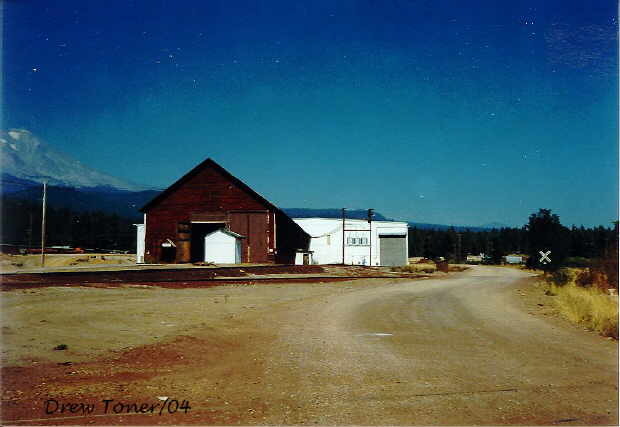 However, the McCloud River had a friendly connection to the BN and the available warehouse, and McCloud and Reno were closely linked by highways. 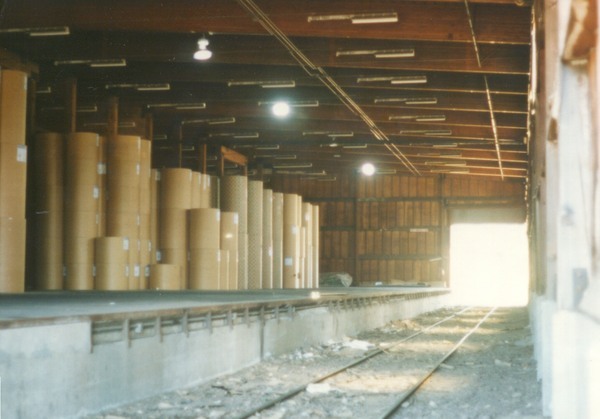 The McCloud River Railroad made a pitch for the paper traffic, and by 1987/1988 the company had a new customer in the warehouse. A new company- Sprint Reload- set up shop in the warehouse. The company soon started receiving 30-60 carloads of paper each week, all of which arrived on the BN at Lookout Junction. The McCloud River Railroad brought the paper to McCloud, where Sprint unloaded the cars and stockpiled the paper in the warehouse until R.R. Donnelley & Sons needed it. Sprint Trucking, an affiliated company, made the final delivery from the warehouse to the printer. The paper arrived in boxcars of all types, mostly belonging to various railroads operating in the northeastern U.S. and Canada. Paper remained as the dominant product handled through Sprint Reload. However, the business did handle other products as offered, with sporadic shipments of huge rolls of wire handled on bulkhead flatcars showing up in the early to mid 1990's. The reload also saw a few carloads of specialty lumber products as well. Sprint Reload remained as the most important customer on the McCloud River Railroad and then the McCloud Railway, with Sprint carloads representing 40-60% of the railroad's entire freight business. However, the world changed around the company towards the end of 1997. One of the conditions imposed on Union Pacific's purchase of the Southern Pacific was that Burlington Northern Santa Fe (BNSF) got trackage rights over the UP-SP system to any point that had been served by both railroads before the merger. The Federal regulators imposed this condition to maintain a competition in the western railroad scene. BNSF thus got trackage rights directly into Reno, which would enable the company to handle the R.R. Donnelley & Sons paper traffic directly into Reno as a mostly single line shipment. The McCloud Railway put out an extra effort to keep this traffic, with a locomotive and crew waiting in Lookout Junction for every carload of paper that BNSF delivered. It was not enough. In the early months of 1998 BNSF commenced operations of its trackage rights trains into Reno, and Sprint Reload closed. The McCloud warehouse has remained mostly silent in the time since Sprint Reload closed. On at least a couple occassions a paper mill located near Eureka, CA, reloaded pulp trucked into McCloud onto boxcars at the warehouse, but this traffic did not last. Dicalite used the warehouse to store pallets of bagged product, but did not ship any of it by rail. The McCloud Railway primarily uses the covered unloading dock to store cabooses and other equipment not used on a regular basis today. The warehouse in the summer of 1986, shortly before Sprint Reload moved in. Photo by Drew Toner. In July 1995 Lee Christopher gained permission to tour the various McCloud shippers active at the time. He took many photographs, mostly to assist him with creating his fine McCloud Railway layout. The pictures he took of the Sprint Reload facility are displayed below. The front of the Sprint building. 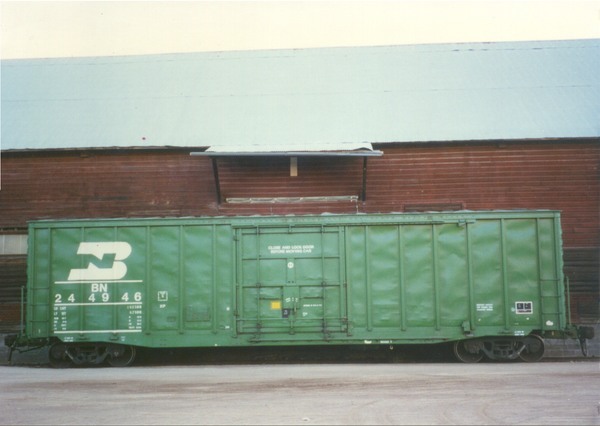 A Burlington Nothern boxcar spotted next to the warehouse for unloading. A peak inside the building reveals many rolls of paper waiting shipment south to Reno. 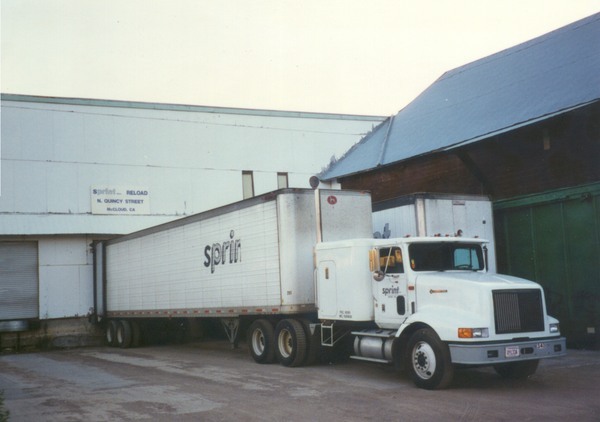 A Sprint Trucking truck being loaded at the loading dock. After Sprint. Empty McCloud River boxcars sit on the old siding. Photo by Peter Ely.